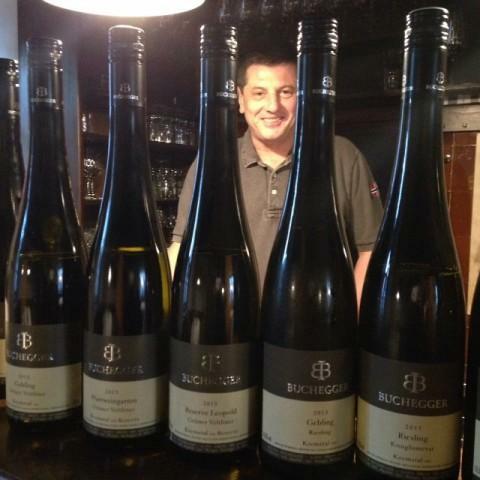 "With no mediocre wines anywhere in the range, Buchegger justifies its renown as one of the Kremstal's finest estates." -Stephen Brook, The Wines of Austria, 2016. Weingut Buchegger was established in 1893. Current owner Walter Buchegger took over from his father in 1994, making him the sixth generation to run the family estate. He has 15 hectares of vines located in the Kremstal on mostly conglomerate soil topped with loess, where he grows Grüner Veltliner and Riesling, with a smattering of Zweigelt, Chardonnay and Merlot. The loess has a high chalk content at 65%. The top sites in his holdings are the Gebling, Holzgasse, Pfarrweingarten, Moosburgerin, and Tiefenthal. Walter farms his vineyards following the Austrian "Kontrolled Integrated Production" or KIP; which is stricter in some ways that the normal organic designation: for example, it places more stringent limits on the amount of copper sulphate allowed and limits the use of tractors which can compact the soil. Allowing the soil to "breathe" leads to healthier root systems and vines. Walter has not used herbicides or insecticides in his vineyards for 25 years. He plants his vines at 4,500 vines per hectare, higher than the average. The Bucheggers are proud that their vines have been around since before scientists were working on clonal breeding and proud also that their vines are all massale selection-- and have been from the time the winery was established. Walter Buchegger makes very classic style wines. He likes to push ripeness and power, but always without botrytis. Walter likes his wines to be clean, fruity, and easy to drink.